There are some days when I almost regret having given Arthur Lough my cell phone number. When he called me last Tuesday to ask if I would like to attend the annual dinner of our local ministerium, at which he was to be the featured speaker, I thought that might be one of those days. Turns out I was very, very wrong. “How long have you known about this gig?” I asked him, before I responded to his request. Our local ministerium, which serves two mostly-rural counties just west of Columbus, is open to all Christian clergy, from one end of the theological spectrum to the other. They meet over lunch on the second Tuesday of each month, and the association’s annual dinner is the capstone of their year. The program generally includes some sort of musical presentation followed by a speaker who is moderately well-known by at least some of the members of the planning committee. Two years ago, so I heard, the speaker was a man who had written a book chronicling his experience in heaven following a serious auto accident. He was apparently declared dead at the scene but then regained consciousness in the hospital ER about ninety minutes later. Reviews of his speech were mixed. 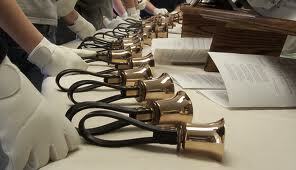 Last night’s music was provided by the handbell choir from a large Methodist church whose pastor is active in the association. The speaker was to have been a Catholic priest who serves on some statewide social services committee by appointment of Ohio’s Republican governor. His sudden illness, which, we were assured, was serious but not life-threatening, meant that th ey had to scramble to find a replacement. Enter Arthur Lough. The woman who called to invite Arthur to speak had assured him that, given the short time he would have to prepare, he should feel free to address any theme he might choose. If, per chance, he was open to a suggestion, she had said, he might consider offering three or four observations or bits of wisdom and counsel from his four decades of vocational ministry in three different theological communions—evangelical, Anabaptist, and Anglican. Arthur told her he would do that. I agreed to drive, as I do most of the time Arthur and I travel together. I prefer that arrangement. Arthur is not great at multi-tasking, so I felt sure that talking to me, thinking about his speech, and driving—all at the same time—might tax his limited capabilities and put our collective safety at risk. “I thought Ellie was coming,” I said to Arthur as he settled himself in my car without his wife. “Uh-oh,” I thought, as a strange, queasy feeling began to develop in the pit of my stomach. The dinner was pleasant enough, and the music was delightful. Then Arthur was introduced. He made his way to the lectern and acknowledged the polite applause. Arthur is a comforting presence on any platform. He immediately puts his audience at ease with a manner combining just the right mix of confidence and self-deprecation. His mien is natural without a hint of pretense. I knew that, whatever he had come to say, his delivery would be effective. Arthur began with a comment both humorous and self-effacing. He then promised to be brief as he addressed the topic which had been suggested. He would make three observations which he had gleaned from more than forty years in vocational ministry. I was carrying with me a small digital recorder which I used, with Arthur’s permission, to record his talk. Here, then, is a nearly verbatim transcript of the salient points from Arthur’s speech. Number two, we need to talk to each other more, particularly about those matters where we disagree. I used to think I could learn everything I needed to know about the positions of people with whom I disagreed by listening to, or reading, people who shared my perspective but thought they could objectively critique their opponents. I now know that is crazy. That “objective critique” almost always turned into a caricature where our strongest arguments were contrasted with our opponents’ weakest ones. It took me more than fifty years to learn the simple truth that many of the people who hold points of view different from mine are just as intelligent, just as thoughtful, just as rational as I am, and some of them are a lot smarter and better informed. After forty years of ministry, I have come to the conclusion that it is almost always too soon to stop talking to each other. Nothing is more effective in dispelling misunderstanding and promoting harmony and tolerance than sitting down with another person, over coffee or a meal, just to talk. And finally, number three, we need to stop using prayer as a cop-out that enables us to avoid doing something about a legitimate need. Here’s what I mean by that. Sometimes that is a comforting response. Sometimes, as in the case of an impending surgery or some similar trauma, it may be all that is within our power to do. Sometimes, however, and far more often than we might imagine, it is a cop-out. It allows us to move on past the awkward moment having offered the semblance of genuine concern, reflected in the promise to pray, but without any genuine consideration of what we might be led and empowered by God to do to help address the need. Another way of saying this might be to suggest that we spend as much time with James as with Paul. All of us need to be reminded, from time to time, of the words in James 2. I remember the story I once heard about the famous nineteenth-century evangelist, D. L. Moody. It seems that, as Moody and his song-leader, Ira Sankey, were returning from a successful evangelistic campaign in Great Britain, the ship on which they were sailing caught fire. And with that story, Arthur brought his talk to a close. It seemed to me that he wanted to say a bit more about his third and final point, but in the moment decided to leave it there and allow God to drive it home more pointedly, if He chose to do so. All in all, it was a good and effective speech. And, if the sustained applause and the generous comments afterward are any gauge, it was well-received by most who heard it. On the drive home, I complimented Arthur on his talk and expressed surprise that his wife, after reading his manuscript, had decided not to attend. This entry was posted in Arthur Lough, discipleship, ministry, prayer, vocational ministry and tagged Arthur Lough, Christian ministry, Christianity, discipleship, prayer, Religion and Spirituality by Eric Kouns. Bookmark the permalink.